Speed: 1333Mhz. Make: Micron. Micron Model Number: MT36JSZF1G72PZ-1G4D1DD. Server Components. Applicable to exports from the UK to another EU country. We dispatch worldwide. We're rated 5/5 for service! Corsair Vengeance 32 GB (2 x 16 GB) DDR4 2400 MHz CMSX32GX4M2A2400C16 . Condition is New. Dispatched with Royal Mail 1st Class. 32GB DDR3 1600 Corsiar XMS3. Corsair Dominator Platinum 32GB (2 x 16GB) Memory Kit 3200MHz DDR4 C16. Condition is New. Dispatched with Royal Mail 1st Class. Will need a motherboard that supports ECC RAM as this will not work in normal DDR3 motherboards. Pulled from a working machine for upgrade. 2x 8GB HyperX, 1600mhz RAM. 32GB Hynix DDR3 SDRAM. 2x 16GB modules. Server RAM not for use in standard desktop computers. Corsair 32GB Vengeance LPX DDR4 3200MHz PC4-25600 RAM 2x16GB cmk32gx4m2b3200c16. Condition is New. Dispatched with Royal Mail 1st Class Large Letter. Used Cosair Dominator DDR3 4x8gb (32gb) 1600mhz. New listing32GB - SK Hynix PC3L-10600R DDR3 RDIMM Server Memory HMT84GR7AMR4A-H9 D8 AD. • 32GB - SK Hynix - PC3L-10600R - Quad Rank - 4Rx4 - CL9 - 240pin. • ECC Registered Memory. 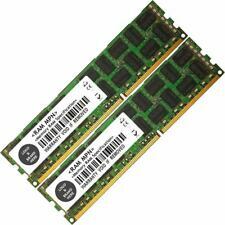 • DDR3-1333 / RDIMM Server Memory. • Hynix P/N : HMT84GR7AMR4A-H9 D8 AD. • Listed as used, Memory is as new condition, Just missing original packaging, tested, removed from working machine. • Packaged Well (Individual/Anti-Static, Box & Bubble). • Sent ‘Recorded Delivery’. Komputer Bay 32GB (4 X 8GB) PC3-12800 1600MHz DDR3 RAM. Non-ECC. Used, in very good condition. Happy to take questions but please check this is compatible with your system as I can’t take returns. Dispatched with insurance via Royal Mail 24 Tracked. HPE - DDR4 - 32 GB - DIMM 288-pin. HP 32GB 2Rx4 PC4-2133P-R Kit. HPE Apollo 4520 Gen9. Extended Specifications. Designed For. Compatibility Information. Data Integrity Check. CL15 (15-15-15). Hi all, Dell Precision T7600 Intel Xeon E5 2687w X2 32gb ram Nvidia Quadro 4000 dell perc h310 raid controller 256gb ssd 2x 2tb Sara 7200rpm 3.5”Hdd This computer was a spare in the office and was only recently opened, I would say it has had a maximum of about two weeks time on so basically new condition, It’s also been upgraded to windows 10 pro Please feel free to ask any questions, Kind Regards, Max. Condition is Used - but working perfectly and looks like new. Corsair Vengeance RGB PRO 32 GB (2 x 16 GB) DDR4 3000 MHz C15 XMP 2.0 Enthu... .